Meet the Canon 6D Mark II- Your most versatile friend so far! These were precisely my vows before embracing my Canon 6D when I started out, as much as I can remember. And as a photographer, the road has been pretty much the same. I am a self-confessed addicts to new technology, so I avoid playing long-term favourites in favour of frequently upgrading my ‘stash’. While one is a favourite for its setting variation, other is a reliable one when it comes to unpredictable conditions. But then Canon launched this light-weight black beauty in Indian market scene late June, and much like others, I am in awe too. Bringing its A-game in versatility (and affordability) department, this one is a dream for those photography lovers who are now considering moving to a full-frame scene. But considering the legacy of the classic Canon 6D series, does this live up to its claim of an ‘upgrade’. Let’s find out! Upon a quick check out, you get a pretty lightweight beauty (about 756 gms to be precise with the battery and card) which reminds you a lot of its five year old predecessor, except for this one looks a touch smaller. There is a textured coating for smooth grip and it also has a dust and drip sealing for those unpredictable outdoor shoots. The controls are placed on easy-to-operate placements like the rest of the series, even though it lacks a dedicated control button exposure compensation. Equipped with a flipping and touchscreen LCD, there is also an ‘illuminate’ feature for the screen, which if you ask me, is quite rad. 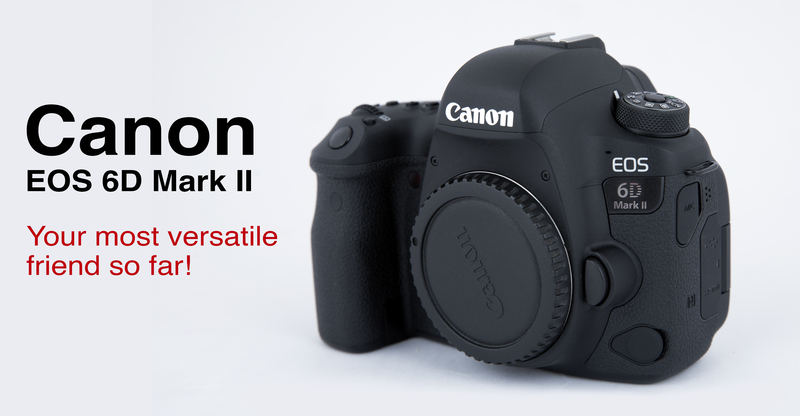 Apart from giving amazing technical features at a super affordable price and weight range, Canon Mk II gives you a dose of familiarity with practical ease, all in a pinch. Now, coming to the features, there are a number of change-ups in this one. Apart from the obvious 26 MP sensor from the original 20 MP, this camera boasts of bluetooth, Wi-fi, NFC for easy smartphone controls, GPS (with a mode 2 option to switch it off when not in use), a crazy speed of 6.5 FPS from original 4.5 and best of all, Canon’s most advanced processor, DIGIC 7. If this wasn’t enough, there is a dual pixel AF too for on-screen autofocus. It’s a bit of a bummer though that the viewfinder has got a 98 percent field-of-view as opposed instead of a 100 percent frame. But its low-light focus feature up to -3EV and 45 AF points (all cross-type) which can be easily selected by a small button right next to the scrolling dial. When it comes to storage, the camera goes cost-efficient and has only one card slot, a little sad because the camera, by itself, is quite capable of shooting sizeable chunks of footage. Nothing spells verdict about a camera better than the images themselves. Overall, I’m impressed with the authenticity of colours and powerful shots I could take with this jack of all trades without adjusting the exposure too much. Probably not ideal for specific genres like sports or wildlife, but the modes operate beautifully and the battery doesn’t disappoint you for next 1200 shots at least, provided you’re not using Wi-Fi. The most excellent feature, however, is its spectacular noise performance, compensating for the absence of high dynamic range that you so enjoy in the ever so popular 5D Mark IV. You get about 8 by-default picture styles for image processing and just when you think you’ve your hands full with this one, Canon sweetens the deal for you a touch more and has added the option to save the edited file as a new image. Another life saver? You have custom functions menu to change the overall functions to your liking and way of working. Convenience, thy name art Canon! Shutter mode is one place where I would like to give a word of caution, while it has a silent mode, I won’t interpret it necessarily as that. In quieter settings, for example, you may hear a small shutting sound disturbance. So that’s that. Overall, Mark II is a delight for people looking at an upgrade to the realm of professional photography or those who would like their camera to be as much of a multi-tasker as they themselves are. And while certain areas do come with their scope of improvement, there isn’t much I’d change or complain about at this price range. With a price point of Rs. 1.32 Lakhs, it’s a wonderful reminder of the original 6D with its functionality and gives a close match to the high-end 5D Mark IV with its 26.2 MP sensor. Next A Wedding Photographer’s Candid Tale: 10 Tips for couples for their best wedding album!